Holiday Hours - October 8: Steele Memorial Library will be open from 10am-6pm; all other CCLD libraries will be closed. 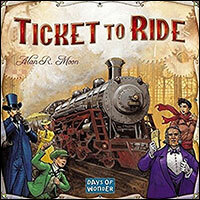 There are currently seven games in the collection: Carcassonne, Forbidden Island, Pandemic, Settlers of Catan, Splendor, The Resistance, and Ticket to Ride. Call (607)733-9175 if you have any questions. Volunteers have always played an important role at Chemung County Library District, assisting the library staff in keeping the library in good order, processing books, and helping to free up the staff to do public programming. Adopt a Shelf - which includes keeping books in the correct order in a particular assigned section of the library. Tell us what your special skills or interests are, if you would like to use your skills to help us out with special programs at the library! We would love to have you join our group of volunteers! If you're interested, fill out a library volunteer application today and return it to Steele or email it to edesk@stls.org. On October 15th at 6:30pm, learn budgeting strategies that can help prepare for a secure financial future. This seminar will be led by Laura Bennett from Chemung Canal Trust Company and is open to adults and teens. Call 733-9175 to register. We have a variety of other activities this month including four art classes! See below for further details. Two very special events are this month! The annual Teen Halloween Dance is here. Teens selected "Creepy Carnival" as our theme. The event is free to all teens in our area. Enjoy food, music, a costume contest, creepy fun house/photo booth, and make a wax replica of your hand! The event will take place Friday, October 26th at 7pm. Second: During Teen Read Week, teens can pick out a free book to keep when they come to an event or check out any books, DVDs, music, etc. Teen Read Week is Oct. 8-13. October 17, 6:30pm - "Write Your Story Workshop" with Tim Collins. Safe Zones (LGBTQ teens & allies) meets every Wednesday. October is here and it is time to run amuck, amuck, amuck! We are celebrating the 25th anniversary of Hocus Pocus all month long. Monday Mania will have spooky tales and witchy crafts. Spooky Stacks offers indoor trick-or-treating, a Halloween party and games for kids, and an opportunity to walk through our new Haunted House. October is hopping at the Big Flats Library! On October 9th, the gift of the month continues with another great gift idea that is inexpensive and fun. We will be making a wooden photo block. You will need to bring two 2-inch square pictures and four 4x2-inch pictures. All other materials will be supplied. Class is limited to 20 adults and will start at 6:00 p.m. You can see the example at the Big Flats Library. On October 16th at 6:00 p.m., we will host another adult craft night. 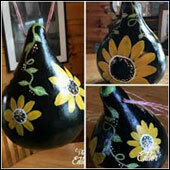 Karen Curren will be here teaching a Gourd Bird House Paint Party. This program is limited to 15 participants and all items are supplied. We hope that you will join us as we create a dazzling ornament that you can hang outside for your feathered friends. On October 23rd at 6:00, we will celebrate Halloween at the library. Come in your costume and enjoy the Spooky Magic of Cris Johnson. A Halloween parade will follow with treats for the children. So that we have enough treats, please call and tell us how many children you plan to bring for the festivities. October 13th we will be at OctoberFest - 14th St Elmira Heights 10-4pm. We will have a fun game with prizes. October 20th we will be at Pumpkin Express - Sullivan Railroad 61 Old Ithaca Road Horseheads 12-4pm. We will have a fall craft and prizes. For the month of September we read "Flight of the Sparrow" by Amy Brown to discuss on October 12th. This month we will read "The story of Arthur Truluv" by Elizabeth Berg to discuss next month. In October at Horseheads, we welcome Paul Dudley Bishop, wild bird artist, for a fascinating presentation on a life with birds! Also, sign up to learn all about your tablet or smartphone! Registration is required. Call 739-4581 to register. Things are getting spooky this month at the Horseheads Free Library. 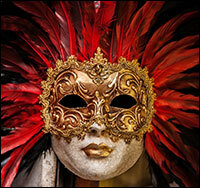 Magician Ron Cain will bring his Monsterology workshop. He will teach us about the lore and legends of different monsters and you will get to make your own monster puppet. Halloween is just around the corner and the Van Etten Library will be offering both children's and adult crafts during the month of October. So stop by and make some awesome Halloween take-home crafts. Happy Halloween!! October 12, 3:45 - Friday Afternoon Movie - "Hotel Transylvania 3: Summer Vacation"
October 17 & 24, 3:30-6:30pm - Kids: Glow in the dark Halloween Mason jar craft. October 20, 1:00-3:00pm - Adults: Halloween Bottle of "BOOS" craft. October 22, 1:30-3:30pm - Tablet Talk: Have tablet or cell phone questions? Bring your device and get some answers! Raining Toad is back again this month! Join us on Tuesday, October 9th at 2:30pm for arcade games. Tweens can make a Halloween/Fall decoration by upcycling tin cans on October 17th at 3pm. Open to ages 8 and up. Register: (607) 733-0541.